Want your child to learn to play tennis? Our 2019 indoor winter session is here at Dearborn Racquet Club. 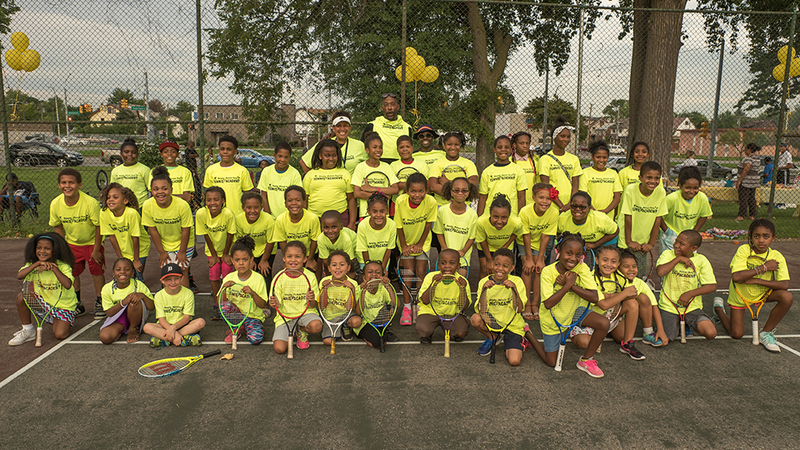 Excellent and affordable instruction for young people ages 5-13 years olds presented by People for Palmer Park (PFPP) with support from the United States Tennis Association (USTA). INDOOR WINTER SESSION REGISTRATION HAS BEGUN! ​at the Dearborn Racquet Club. Contact Leonora King, our Tennis Director at 313-757-2751 or tennis@peopleforpalmerpark.org for questions or more info. Beginner youth tennis lessons on Saturdays or Sundays. Tennis rackets, balls provided. Tennis shoes AND socks are required. Advanced Beginner youth tennis lessons on Saturdays or Sundays. Learn how to improve your tennis skills! Excellent instruction for more advanced young players who should have at least 2 years playing experience with the program. Players should have a moderate level of consistency with ground strokes, serve, and volleys, and know how to keep score. Tennis rackets, balls provided. Tennis shoes AND socks are required. The PFPP Tennis Academy moves indoors for the fall and winter months. Summer classes outdoors will resume in 2019 at the ALL NEW reconstructed Palmer Park Tennis Courts. ​PFPP Tennis Academy is presented with support by the United States Tennis Association (USTA). East side of the park, on Woodward Ave. between McNichols (6 Mile) and 7 Mile Rd. Palmer Park Tennis Academy is made possible by these generous sponsors!